We’re excited to celebrate our 20th Anniversary! In 1994 doctors began instructing new mothers to put their babies on their backs to sleep. This “Back to Sleep” Campaign resulted in a drop in sudden infant death rates of 50 percent in the U.S., but sleep-related deaths remained the number one cause of infant deaths after the first month of age. Judy Bannon, Executive Director of Sudden Infant Death Services of PA, a Pittsburgh-based nonprofit, realized most of the deaths she was seeing were from lower-income areas and were predominantly African-American infants. She was wondering if there was a reason that at-risk families were not responding to the Back to Sleep Campaign, when another trend caught her attention: of these deaths, most were not found in cribs, but on couches or in chairs or adult beds. Was it possible that these babies were dying for the simple and tragic reason that their mothers couldn’t afford cribs and/or had not been educated about infant safe sleeping practices? The mission became clear: provide cribs to babies whose mothers could not afford them and educate mothers about the dangers of unsafe-sleep environments. In 1998 Judy created Cribs for Kids® to do just that. Cribs for Kids originated in Pittsburgh, Pennsylvania in 1998. In order to reflect our true mission and our national presence, in 2002, we officially changed our name from Sudden Infant Death Services of Pennsylvania (SIDS of PA) to Cribs for Kids®, Inc. Launched in July 2002, our revamped website, www.cribsforkids.org, featured our new Cribs for Kids® logo. The different colored hearts that adorn the logo represent diversity and the tagline makes it clear what the goal of Cribs for Kids® is….’helping every baby sleep safer’. To accomplish this, we decided early on that we would not just educate the public about the importance of infant safe sleep but we would make sure that every baby had a safe sleeping environment. In 2006 Cribs for Kids® was beginning to grow into a national organization. Presently, we have Trademark License Agreements signed by over 950 partners throughout the United States. Through this network of partners, we have provided infant safe sleep education and close to 500,000 cribs, portable crib sheets, Halo Sleep Sacks and pacifiers to families in need. Our partners span the United States from Saipan, MP to Portland, Maine and everywhere in between. 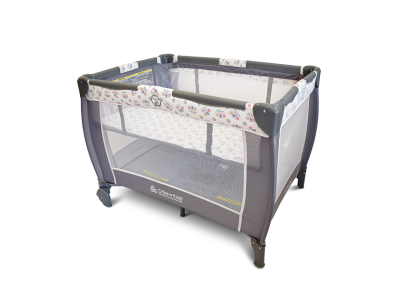 Corporate partnerships from PITT-OHIO EXPRESS, and other generous companies and organizations have enabled Cribs for Kids® Partners to purchase cribs for families in need through discounted pricing and free shipping and, as a result, save more babies’ lives. Over the years our choice of a safe sleeping environment has transitioned from full-sized cribs to the Pack n Play and now to our own playard-type unit, the Cribette. This unit, which has all the safety features of the Pack n Play, brings the infant safe sleep message front and center to all caregivers with the safe sleep message imprinted on the fabric – A B C – Alone on my Back in a Crib. This makes the Cribette an educational tool, in addition to being a safe sleeping environment. In order to accomplish our mission of being an infant safe sleep education program, with the intervention of safe sleeping environments for families in need, we worked diligently from the beginning to make education the cornerstone of our organization. To this end, in October 2010, we were instrumental in the passage of Pennsylvania Act 73 of 2010. This Act, signed into law by Governor Edward Rendell mandates that every mother, before leaving a birthing hospital in the Commonwealth, be given infant safe sleep education. Pennsylvania is the first state to pass such legislation. The language for this legislation continues to be duplicated and passed into law in other states. In addition, Act 73 was the cornerstone for our Hospital Certification Program. Cribs for Kids® is proud to report that in addition to Hospital Certification, we have expanded our programming to include our Public Safety Initiatives (Cops ‘n Cribs and Operation Sleep Sound) and Managed Care Organizations’ programs. These programs, along with our ongoing Safe Sleep Ambassador Program are offered to our Cribs for Kids Partners at no cost. Most importantly, through our network of over 1,400 partners, we are able to spread a clear, concise safe sleep message throughout the country, resulting in a decrease in infant sleep-related deaths. It really doesn’t get any better than that, as together, we are helping every baby sleep safer!